May 24th - 26th: Our First Spreadsheet! People are great at processing images, making connections between words and concepts, and remembering things. But we are NOT so good at mentally processing and storing accurate, easy-to-use data..
Data Tables—also known as spreadsheets—were invented to organize information that our brains can't easily recall. Spreadsheets help us sort and label in a way that makes sense, so we can refer to it later. 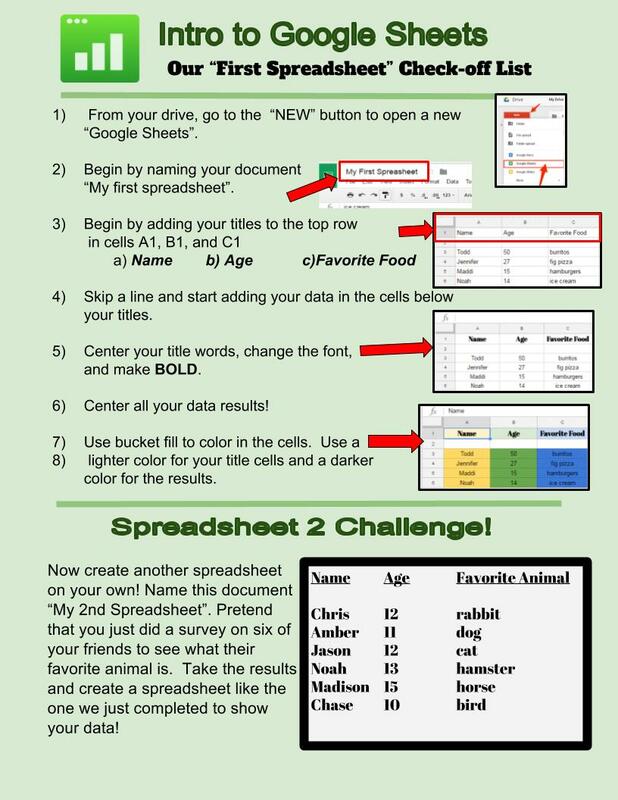 3) Complete your first spreadsheet using the "Check - off list provided"
4) Do the "Spreadsheet 2 Challenge on your own! Goggle Sheets - Introduction from Patty Barbosa on Vimeo. Google Spreadsheets video 1 from Jennifer DeRita on Vimeo.